NOW HIRING… in ALL areas of the YMCA! Must have American Red Cross Certification or other recognized rescue certification such as Boy Scouts of America or Ellis Guarding. Our facility has 2 indoor pools- 25 meter lap swim pool and shallow water rehabilitation pool. Activities requiring guards include swim lessons, open swim, lap swim, party rentals and swim team practice. Day, evening & weekend shifts available. Membership benefits as well as flexible scheduling options. 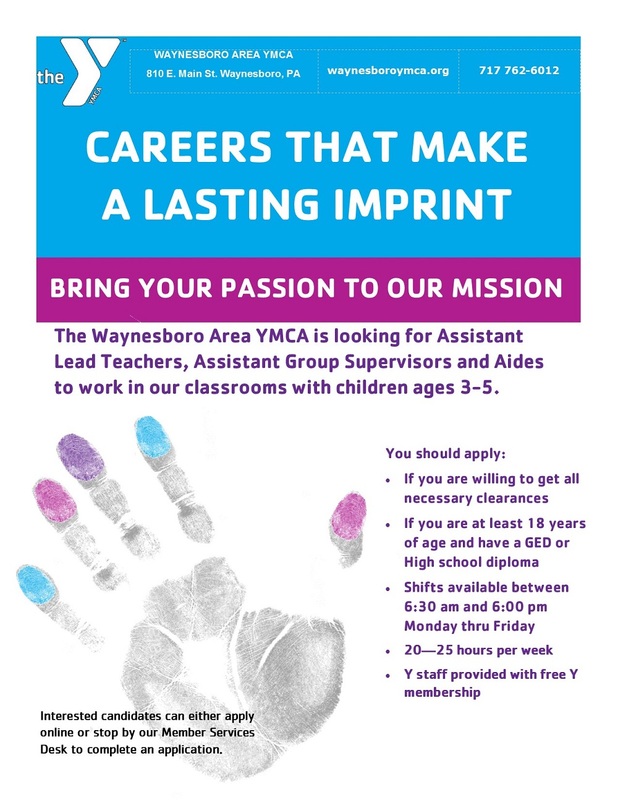 The Waynesboro, PA YMCA is expanding our Before and After School care program into all the Elementary Schools in the area, and are in need of Before and After School Counselors. Interested candidates can either apply online or stop by our Member Services Desk to complete an application. Our Personal Trainers work both one-on-one and in small groups with members and program participants to help people develop a health lifestyle and meet fitness goals. Utilizing fitness knowledge and experience, Personal Trainers act as “fitness experts” for YMCA members. The Y offers a safe and supportive environment, competitive pay, and Y staff are provided with free Y memberships. If you have any additional questions, please call 717-762-6012. Description: Under the direction of the Sports and Recreation Director the Teen Coordinator is responsible for planning and implementing of youth development and teen activities for the Waynesboro Area YMCA. The focus is placed on the YMCA core values of caring, honesty, respect, and responsibility. Description: Responsible for overseeing a designated program area, acting as a unit lead and/or providing program administrative support at camp. The Camp Lead may support camp counselors as a unit lead as well as direct service to campers. The incumbent provides high-quality experiences for campers that focus on the YMCA core values: caring, honesty, respect, and responsibility. Job Description: The Camp Counselor is responsible for planning, leading, and implementing core and non-core programs and experiences for children in a small group setting. They will also be responsible for the general safety and development, growth, and skill achievement of the participants in his/her group. The incumbent will provide high quality outdoor educational and recreational experiences for participants that focus on the YMCA core values of caring, honesty, respect, and responsibility. Click here to view/print our employment application. The Y is looking for assistant lead teachers, assistant group supervisors and aids to work in our classrooms with children ages 3-5.